I got these two on the cheap off Amazon. I think Salt Lake was 99 cents, and ET was a few bucks (both new). Great E.T. review. Never knew of that one before, but it gets me thinking.. a modern remake of the Atari game would be sort of cool, especially if it improved and updated the graphics and gameplay. I was hoping that that's what this GBA game was, but it doesn't sound like it from the review. Typo alert in that review in a couple spots: you have Elliott's name as "Ellicott".. snuck a "c" in there. And "like a living hell" should be "life a living hell". Retro STrife wrote: By the way, here's an obscure European game for the Atari 2600 that might be up your alley. I believe it's official name is "Alien's Return", but some people refer to it as "E.T. Go Home". Have you reviewed the GBC E.T. game? No; looks like you haven't. If you find a copy you could do an ET special, with the 2600, Atari 8-bit, GBC, & GBA versions. Having all of 'em on one page might be nice. I've actually reviewed seven ET games, and here are the scores I gave them. Cosmic Garden is the only one that felt entertaining. It's a small-scale farming simulator. I should add that Escape From Planet Earth is also entertaining, as it is mainly a puzzle game. It's a little like Lolo. Ah, thanks. I was never aware that they released it under that name too. Weird. By the way, has there ever been better cover art than that fake ET game? I'm being genuinely honest that it's my favorite cover art of all time, and the only reason I bought the game a few years ago. I mean, I know it's not beautiful like some other Atari cover art, but it's so ridiculous that it's absolutely captivating. I can't look away. Here's an E.T. lookalike, leading a colorful ragtag band of animated objects, including a piece of toast that is way too happy, all topped off with that amazing nonsensical "E.T. go come" banner. It's the greatest thing I've ever seen in my life. Retro STrife wrote: By the way, has there ever been better cover art than that fake ET game? I'm being genuinely honest that it's my favorite cover art of all time, and the only reason I bought the game a few years ago. I mean, I know it's not beautiful like some other Atari cover art, but it's so ridiculous that it's absolutely captivating. I can't look away. Here's an E.T. lookalike, leading a colorful ragtag band of animated objects, including a piece of toast that is way too happy, all topped off with that amazing nonsensical "E.T. go come" banner. It's the greatest thing I've ever seen in my life. 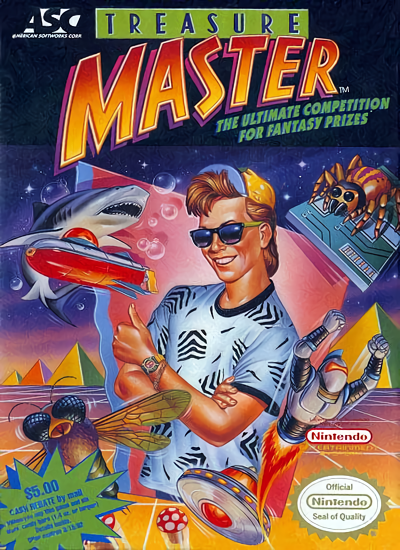 I was going to say Treasure Master, but you know what, even that doesn't have anything to rival the perfect idiocy of that little banner. E-T gO COME. E-T gO COME! Nice to see some new GBA reviews.